Cooling Components offer a huge range of Hoses for many automotive applications, including classic cars, commercial vehicles, agricultural and off-highway. Customer bespoke requirements can also be fulfilled. All products are sourced from a major OE supplier and produced under ISO/TS16949 certification. Both reinforced and non-reinforced hose types are available in a wide range of materials including EPDM, silicon and Vamac. Reinforced hoses comprise of three layers: inner rubber lining, reinforced yarn for extra strength and an external cover for overall protection. They are designed to provide resistance to pressure, ozone, weathering, heat and cracking. 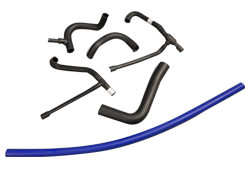 Non-reinforced hoses are mainly designed for bypasses with low pressure and where burst and strength are not crucial.